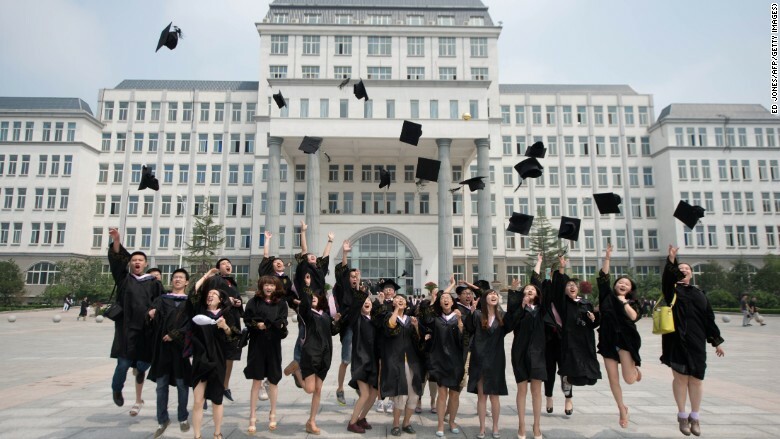 Alibaba, Bank of China and Huawei -- these are the dream employers for Chinese students, according to a new survey. The survey of more than 55,000 students, conducted by research firm Universum, found that roughly a quarter want to work for an international company, while only 9% want to work for a start-up. Five percent want to start their own business. The students said that work-life balance was the most important career goal, followed by job stability. When it comes to desirable companies, Bank of China (BACHF) has been named the top choice by business students for seven consecutive years, and the gigantic state-owned firm shows no signs of relinquishing its lead. William Wu, the China country manager for Universum, said that banking remains an attractive industry for young Chinese. "China's government is now emphasizing the revolution of the finance industry, which leaves the younger generation with the impression that although banking is a traditional industry, there are still a lot of development opportunities," Wu said. E-commerce giant Alibaba (BABA) improved six places from 2014, ranking second among business students. Alibaba's rise shouldn't come as much of a surprise -- the company held a record-breaking $25 billion IPO in September. Among engineering students, Alibaba was once again a bridesmaid. Instead, Huawei -- a telecoms infrastructure firm that now makes consumer products -- took the top spot. "Both of these companies are pioneers in terms of local companies going international," said Wu. "It shows that ... an international development strategy has a positive influence among Chinese young talents." Tech companies ruled the rankings for humanities students, with Alibaba -- which was ninth in 2014 -- landing at the top. Last year, Apple was the Number 1 choice of Chinese students.